As much as I love playing board games, one thing that sometimes puts me off is how long it can take to set them up. If you only want to play for an hour spending half that time getting a game ready to start doesn’t really help the mood. So when a fun game comes along that takes hardly any time at all to set up and lets me play it with my 6 year old, it’s rarely a bad thing. And so we come to Time Breaker, a really cool simple game which has you leaping through time trying to catch an elusive enemy. The game is played on a randomly positioned grid of 25 tiles, and with the centre tile being the only one which is always the same (the headquarters of the agency) that gives you a bewildering number of different board layouts – write a 6 followed by 23 zeros and you’ll get the idea of how many varieties there are. 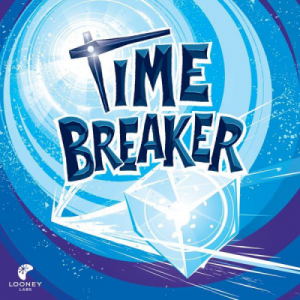 The Time Breaker – a clear cube – always starts the game in the top left corner, with yourself and other players starting in the very middle. By using actions from a hand of cards you need to move around, travelling to various time periods until you arrive in the same year as the Breaker. At that point you can arrest him, then try and drag him back to the headquarters in the middle. But moving around isn’t as easy as just moving to the next tile along and snaking your way towards the Breaker’s position. You’re limited by what’s on the cards in your hand, and while some cards will allow you to move vertically or horizontally, using them will force you to discard it. Other options might allow you to travel through time, either to a specific time period if you have that card, or by following the arrow on the tile you’re on. The latter option could send you to somewhere that looks further away, but with the tiles being so jumbled up the bottom right corner could be a single time warp away from the top left; planning ahead and figuring out the path to the Time Breaker is a really handy thing to get in your head to help you find your way there. That comes crashing down though when the Breaker itself moves, either through a player’s actions or by someone moving while it’s under arrest. It’s possible for the Breaker to escape arrest as well, leaving it hanging around somewhere on the board, in a totally different point in history, while you frantically start to rebuild your strategy on how to get there. The game moves quickly, and will often take less than 20 minutes to get through. There isn’t much to think about either, and with a fairly small number of cards in your hand at any one time the different options won’t cause players to hold the game up for long while they decide what to do next. 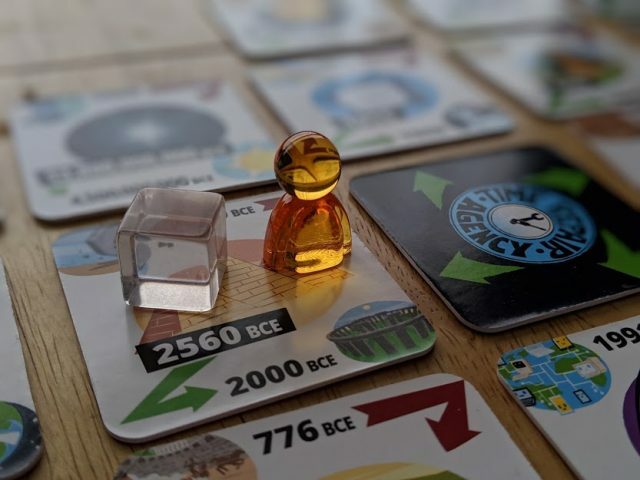 It even works with kids – my aforementioned 6 year old was able to read most of the cards and understand how they worked, and while some of the numbers were on the bigger side and needed to be found together, the game itself was easy to understand and played nicely as a family. So for a quick game with not too much depth, but still opening up the chance of some strategy, Time Breaker fits the bill nicely. It’s easy to learn, easy to play and takes no time at all to set up and put away. A very cool little game.